Bidirectional path tracing can converge faster than forward path tracing for interior scenes or scenes with significant indirect illumination. In particular, when forward path tracing can't easily find an indirect path to the dominant light source, bidirectional path tracing can help especially if the dominant light source is "one bounce" away from illuminating the scene. It also offers the possibility of faster indirect lighting in general because bidirectional path tracing can make multiple connections between a light path and a eye path and reuse shader evaluations. (A forward path tracer has to run a shader at every bounce, and therefore cannot reuse shader evaluations.) Note that this benefit is more pronounced if your pattern evaluations are expensive; Bxdfs without pattern inputs will not benefit from this. Progressive photon mapping converges faster for specular-diffuse-specular lighting (reflections or refractions of caustics), most especially when dealing with relatively small light sources. These sampling techniques are combined along with direct lighting (connecting an eye vertex directly to a light source) using multiple importance sampling in a way such that the combined algorithm is substantially more robust and converges faster across a wide range of shots than simply using any one technique by itself. The PxrVCM integrator in its default mode of operation enables all of these techniques, but should the need present itself, can also operate as a pure bidirectional path tracer, a pure unidirectional path tracer, or even use pure progressive photon mapping by disabling merging and/or connecting via the mergePaths and connectPaths parameters. 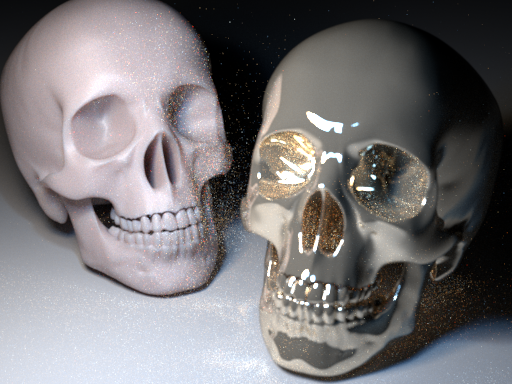 Rendered using only forward path tracing (mergePaths=0, connectPaths=0), 512 samples per pixel. Caustics are very noisy, and many fireflies are present due to the difficult to integrate lighting caused by the highly specular metallic skull. Rendered using the full vertex connecting and merging algorithm (mergePaths=1, connectPaths=1), 512 samples per pixel. Fireflies are almost nonexistent, and caustics are much better resolved. PxrVCM fully supports multiple scattering of volumes. Bidirectional path tracing in particular is well suited for multiple scattering of volumes. PxrVCM does not currently support volumetric photons; as a result, effects such as volumetric caustics may be slow to converge. PxrVCM does not support the ability to turn off caustic light paths. In order to match the result from PxrVCM, images generated by PxrPathTracer should be rendered with allowCaustics set to 1. PxrVCM is less forgiving for having different numLightSamples than numBxdfSamples than PxrPathTracer. They should (nearly) always be be set to the same value -- otherwise unnecessary noise can appear. Controls whether "vertex merging" is employed. Vertex merging enables a variant of progressive photon mapping, which converges faster than path tracing for specular-diffuse-specular (caustic) lighting. Enabling vertex merging is generally recommended but does result in additional time and memory overhead for photons, and in scenes with little specular-diffuse-specular transport, may be unnecessary. Set this parameter to either 0 (vertex merging off) or 1 (vertex merging on). By default, vertex merging is enabled. Note that photon generation requires the incremental flag be turned on for the Hider; the photons generated in the current increment are used as the photon map for the next increment. Controls whether "vertex connection" is employed. The power of bidirectional path tracing over forward path tracing is in the ability to repeatedly reuse indirect contributions down the full combined path by making repeated connections between the eye and light paths, leading to faster convergence for interior scenes with significant indirect illumination. Specifies a scaling factor for the radius used in vertex merging. By default, the VCM integrator computes an automatic radius for vertex merging, based on ray differentials computed along the eye path. This parameter specifies an additional scaling factor to be applied to the default computed radius. Increasing the scaling factor will blur the influence of a photon over a wider region, which may be helpful in reducing noisy caustics. However, increasing the radius will also slow down merging and increase the initial bias of progressive photon mapping, requiring more iterations to arrive at a bias-free result. The default value of 5.0 significantly reduces noise at the cost of some initial bias which decreases with more samples. Should these bias artifacts be objectionable when using low numbers of samples, decreasing the mergeRadiusScale will reduce these artifacts at the expense of more noise. Specifies the maximum difference in time, measured as a fraction of the shutter interval, over which photons are merged. By default, the timeRadius is 1.0: eye vertices can be merged with photons emitted at any time. This may lead to inaccurate results (i.e. smearing in time) for caustics from moving objects. Setting the timeRadius to a smaller value tightens the search radius in time for mergeable photons, leading to better results for motion blurred caustics, at the cost of static objects requiring more photons in order to resolve caustics. Controls the number of light samples for direct illumination per vertex on the eye path. The default is 1. For lowest noise numLightSamples and numBxdfSamples should be set to the same value. Controls the number of Bxdf samples for direct illumination per vertex on the eye path. The default is 1. For lowest noise numLightSamples and numBxdfSamples should be set to the same value. Controls the path length at which the integrator begins performing Russian roulette in order to reduce overall path length. The default is 4. Note that Russian roulette is applied separately to both the eye and the light paths. Controls the path throughput threshold below which to begin performing Russian roulette. The default is 0.2. Increasing the threshold will lead to a reduction in path length, which will lead to an overall increase in speed at the expense of higher noise. By default the PxrVCM integrator clamps the luminance computed by any technique on any vertex to be at most 10.0. However, it is possible to change this behavior by specifying a different value for the clampLuminance parameter. Specifying a relatively low value for the clampLuminance parameter (for example, between 2 and 20) can greatly speed up convergence. In some cases, indirect illumination lights paths may be noticeably dimmer due to clamping; this may be an acceptable trade-off in certain cases. Setting this parameter to a very large number (such as 1e30) will effectively disable all clamping. The default is 10.0.